After so little buying of STUFF this summer, this month's haul feels HUGE! I've been quite happy with "shopping my untrieds", but I did pick up some really awesome new goodies as well! 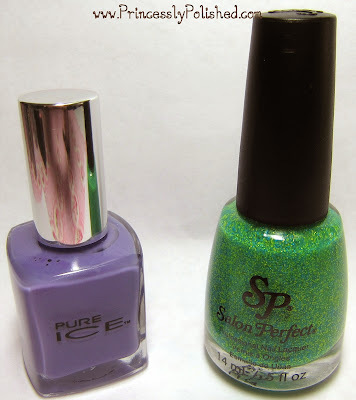 Pure Ice Fairy Godmother and Salon Perfect Kaboom. These were both found at Walmart. I've already swatched Fairy Godmother, which I love. It's a perfect shade of purple and only $2 for a bottle! Kaboom is a Floam-type glitter dupe, and the only one I found from Salon Perfect's summer neon glitter collection. I'm really surprised that China Glaze didn't decide to put out these colors under their name, and make them more widely available. Oh well. I figure it should be handy for nail art! Between one polish being a tricky purple and the other a neon these are very hard to photograph, but this quick picture is actually pretty accurate on my screen. Color Club Beyond, Over The Moon, Kismet, Cosmic Fate, Miss Bliss and Eternal Beauty. The entire 2013 Halo Hues collection! These were a gift from my husband, which makes them even more special! I had the collection on my wishlist and he snagged them right away (without my knowing) when I found them at a decent price on Amazon. The colors are awesome and very holographic. I hope that Color Club keeps releasing more Halo Hues because they are so good for the price! 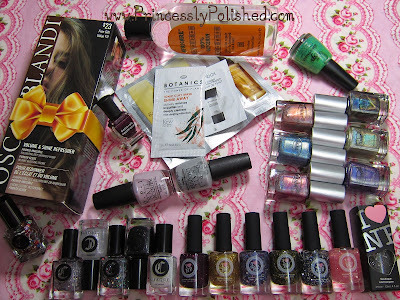 I snatched up polishes on my wishlist that were being discontinued when I Love Nail Polish announced them going on sale. So far I've tried Once Upon A Starry Night and Angel Burp and shared them here. I really love these polishes, from the super-cute but practical packaging they come in to the pretty bottles with their thin grippy handles. The shipping was fast, too! So glad to finally have these pretties in my collection~ These came right from http://www.ilnp.com/. Finally, I splurged and bought all the Cirque Colors polishes on my wishlist. They were actually all in stock at the same time (they never are during a sale... =( sigh!) so I gave in. Didn't want to miss them if they get phased out or something! I can honestly say that these babies are STUNNING. They've been swatched on a lot of great blogs already, but I'll be sharing my own creations with them, too! I have a sneaking suspicion that photos aren't going to do them justice, though... These came from http://www.cirquecolors.com/home/. So, that's the damage for this month. So many very nice polishes, it's hard to know what to try next! If you have any requests for what you would like to see layered, compared, or reviewed in particular leave a comment below!